A women’s cooperative in Pa Daeng village has set up a weaving group. The Pa Deang village’s weaving group is run by Maechee Pranorn, a nun of the temple in Mae Pang. Pa Daeng Village Women’s Weaving Group is reviving the neglected art of weaving. Maechee Pranorn began the Village Women Weaving Group with five more members of Pa Daeng temple. They saw the need for the village women to develop a skill which they had practiced in the past, but has since been neglected. Maechee Pranorn hoped that the weaving group would help the women gain an income and independence within their community. A weaving expert from Lamphun has been teaching the women of Pa Daeng techniques to weave modern designs into their cloth. 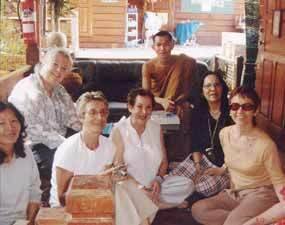 The weaving group began by making shawls in Pa Daeng temple, after being given permission by the abbot of Mae Pang sub-district, Phrao. The weaving group, which consists mostly of elderly women who also take care of their grandchildren, will continue to weave at the temple until they receive support to move into their own premises. Happy fund raisers at Buonissimo Restaurant help swell the coffers for the annual Rooftop Charity Party. 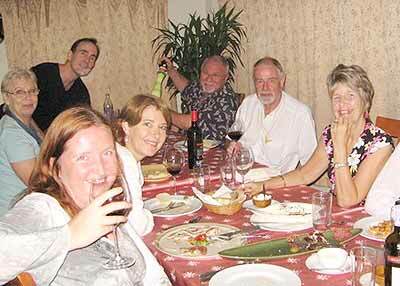 A dinner held at Buonissimo Italian Restaurant on October 4 saw some 38 people turn up to try the delicious food and great wine. The dinner, which included a small raffle was held to help raise funds for the Hillside 4 Charity Rooftop Party that is, at present, scheduled for January 13, 2007. The dinner was also held in order to thank Buonissimo for the support they have given to previous Rooftop Parties. The next fundraising dinner will be held during Loy Krathong on November 4 at the River Ping Palace. The entrance price will be 600 baht per person, which will go to the restaurant. The dinner will, however, feature a raffle to raise funds for the Rooftop Party, along with krathongs and balloons. (From left) Chiang Mai Deputy Governor Wilad Rujiwattanapong, Nick Bauer, GM of the Imperial Mae Ping Hotel and Hagen Dirksen, Consul General of Germany to Chiang Mai jointly presided over the 2nd Oktoberfest. 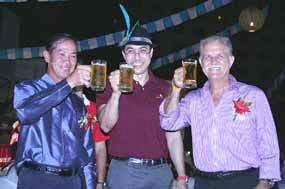 For the second year running Chiang Mai’s very own Oktoberfest was opened at the Imperial Mae Ping Hotel on September 30. Oktoberfest, a German beer festival originating in Munich ran from September 30 to October 7 in the hotel’s beer garden. The opening ceremony was presided over by Hagen Dirksen, consul general of Germany to Chiang Mai, and Wilad Rujiwattanapong, Chiang Mai deputy governor. Both were welcomed by Nick Bauer, GM of Imperial Mae Ping Hotel. Music for the occasion was provided by the Yapparaj Wittayalai School band. Visitors to the festival had the chance to sample various German beers and try traditional foods such as German pork leg and smoked German sausages. Students’ photographic art work is on display at the exhibition. The Faculty of Fine Art, Chiang Mai University, is holding the 6th Independent Photographic Exhibition at Kad Suan Kaew department store from now until November 2. The exhibition, which is part of the faculty’s photography course, is displaying works by students that combined photography and technology skills along with artistic ability. 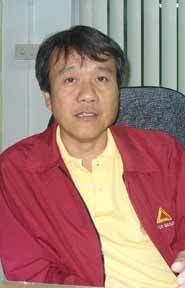 Ajarn Chaiyos Chanthatip, vice-dean of the Faculty of Fine Arts, said that rapid advances in digital photography technology have increased the creative and artistic potential of photographs, and that this technology is constantly developing. 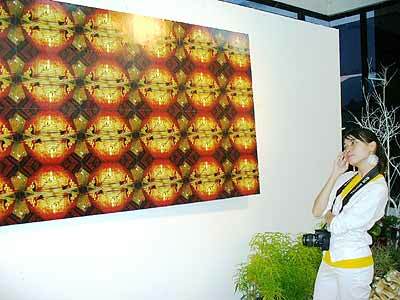 The exhibition was officially opened on October 2. Members of the public interested in viewing the exhibition can visit between 11 a.m. and midnight on the ground floor of Kad Suan Kaew department store. Beer imbibers in Chiang Mai will indeed have something to grin about with the arrival of 10 Belgians. While this will have no impact on the local beer market, I can see the connoisseur soon forgetting what colour a bottle of Heineken is. The respect most countries devote to a good wine, Belgium devotes to its beer. The country boasts 120 breweries, churning out some 500 beers in 10 styles. In my mind no other nation brews so many unique beers. HORECA of Chiang Mai introduces fine Belgian beer to Northern Thailand: Taste testing are (L-R) Stefano Roncoroni, La Gondola Restaurant, Ussaneethorn Thaemkhunthod, Amari Rincome Hotel, Pornkamol and Frank Salveta, Belgian Beer. A demonstration on September 19 at the Amari Rincome Hotel featured 10 varieties of Belgian beer, including 3 fruit beers for the ladies at with a 3.5% alcohol content, Rochefort, the heavyweight at 9.2%, the sweet yet strong Duvel, pale and brown varieties of Leffe, and Kwak, a dark Amber. Rounding out the list are two thirst quenchers, Palm and Hoegaarden. As one is poured you instantly see a difference from other mainstream quaffs. Delicately poured in each brew’s own goblet, flute or other suitable glass it quickly releases a most pleasing aroma. These beers can now be found at a handful of pubs and some higher-end establishments. All in all, a strong recommendation goes out to the uninitiated from this beer-savvy sot. Spa Asia, the region’s leading magazine for spa owners and customers, sponsors the Asian spa industry’s annual awards festival. This year, Chiang Mai Oasis Spa was ranked as one of the top eight day-spas in Asia. Competing against some of the most highly regarded and elegant spas in the world, spokespersons from the Chiang Mai Oasis spa said they felt honoured to be considered on a par with the best of the best. Out of the thousands of applicants under consideration for Spa Asia’s Crystal Awards, only eight spas were chosen to compete in each category. Nominees were selected based on results obtained from months of online readership polls, feedback from spa customers and exhaustive research from a secret panel of judges who spent several months visiting each spa. 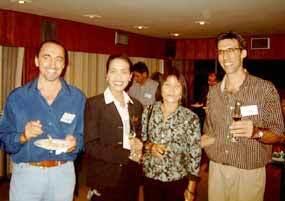 At the 2006 Crystal Awards ceremony, held in Hua Hin, it was noted that the Chiang Mai Oasis Spa was one of the youngest spas competing in any category, being less than three years old. Although Oasis Spa did not win in its category it received a special mention for its high standard of service. The newly renovated Kalae Night Bazaar is due to reopen at the beginning of November after almost one year and 50 million baht has been spent on its refurbishment. The new-look night bazaar will feature almost 400 booths selling handicraft products and offer a less stressful shopping experience than the narrow and crowded alleyways of the street night bazaar. Somchai Euawongchai, manager of Kalae Night Bazaar Co., Ltd.
Somchai Euawongchai, manager of Kalae Night Bazaar Co. Ltd., said that he hoped the new night bazaar would become recognised as a handicraft wholesale and retail centre and attract business owners and foreign tourists seeking to export Thai products. He added that the night bazaar, located on 7 rai of land, is almost 100% complete and that the official opening would take place in early November. He said he hoped Kalae Night Bazaar would serve as an alternative to the street market, with wide spaces between the booths and a wider variety of products. Kalae Night Bazaar will be zoned into various retail sections, with an additional ‘green area’ where shoppers can sit and relax. A food centre will sell various kinds of food, all of which will be certified by the Clean Food Good Taste project to ensure acceptable standards of hygiene. The parking area will support 200 vehicles, with plans to increase this in the future. 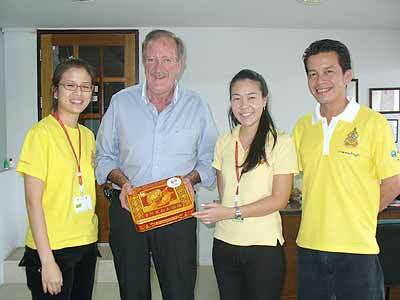 Sirirat Channila (2nd from right) and Chanthaklit Klittham (left), sales promotion officers of Central Airport Plaza department store, Chiang Mai, presented moon cakes to Murray Dickson, Chiangmai Mail GM and managing editor, and Chiangmai Mail editor Nopniwat Krailerg on the occasion of the Day of the Holy Moon. 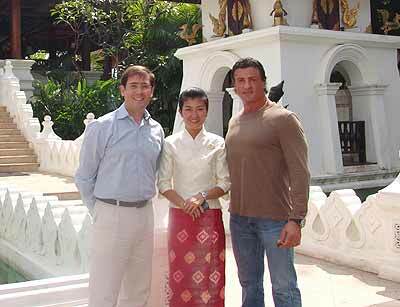 Mark Bradford (left), general manager of Mandarin Oriental Dhara Dhevi, Chiang Mai together with Chomphunuch Thongkham, the resort’s guest relations manager welcomed famous Hollywood movie star Sylvester Stallone during a visit to Chiang Mai and overnight stay at the resort recently. Chiang Mai businessman and local personality Aart Roffel passed away in Holland last weekend following a long battle with cancer. He was aged 55. Aart had returned to his native Holland several weeks ago to spend time with family and friends in the city of Gorinchem. Chiangmai Mail readers will remember Aart from a “Local Personality” feature on him written by Basil McCall earlier this year. 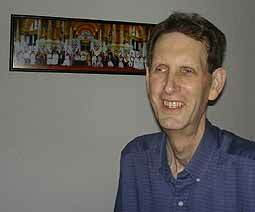 We understand his ashes will be returned to Thailand following a ceremony in Holland.